Sunday, Feb 3, 10:15 am-noon in Room 150. Come to the first service so that you can attend this meeting. Clean energy is the first focus of the UUCC Climate Change team because it will have the most impact worldwide and because it’s now easily doable by almost everyone. 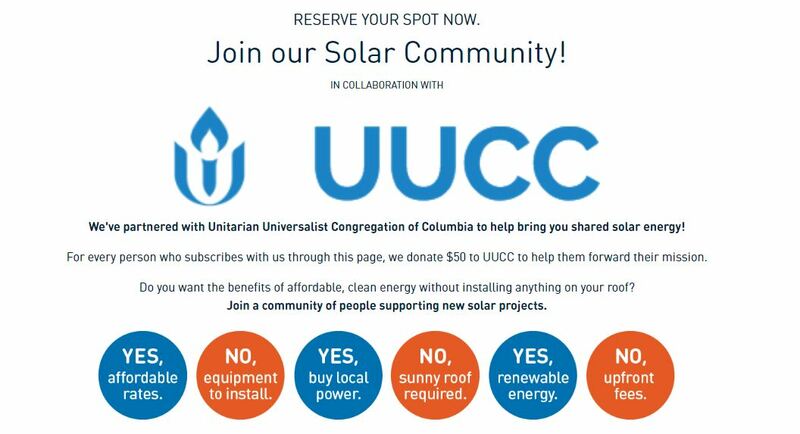 So, we’re pleased to announce that UUCC has partnered with a local social enterprise, Neighborhood Sun, to give you an affordable, clean energy option known as community solar. You can now subscribe to the electricity produced by a local solar facility right here in Maryland! Together, with hundreds of other subscribers in your neighborhood, you can join a shared solar project and get your electricity WITHOUT installing any panels on your roof or paying upfront fees. What do you need to do? Just decide to buy local clean energy, that’s all! Come to the Sunday Forum and ask your questions! Lock in a convenient and stable rate for your electricity. With a Neighborhood Sun’s subscription, there are no surprises, no rate hikes, no risks! Be a member of a strong community of local solar supporters. To Neighborhood Sun, that means bringing people together while helping our planet! We can’t solve climate change unless everyone is involved, not just the select few. Neighborhood Sun is local and will be your consumer advocate and your solar champion in the community. Choose this link when you sign up so UUCC will get $50!